response from property - Apr 02, 2019 Thank you for your feedback and for choosing Northgate Village as your home! I think the property is nice.submitted by Pamela M. - Jan 04, 2019 |Recommended: YesI like living here because there is no loitering, or people hanging out. It is basically quiet, which I like. When I come home late at night, I don't feel any danger in the parking area. response from property - Jan 08, 2019 Thank you for your feedback! We are very happy to hear you are enjoying your apartment and the community. Thank you for being a part of the Northgate Family!! Nice location in burilngton. Safe for a son and single fathersubmitted by Kelly C. - Nov 06, 2018 |Recommended: YesGreat staff and the grounds are well-kept. The laundry facilities are clean and safe. response from property - Nov 08, 2018 Thank you for your feedback! The staff at Northgate takes great pride in our community and providing superior service. We are happy you chose to make Northgate Village your home. response from property - Sep 06, 2018 Thank you for your review! We appreciate you taking the time to let us know about your living experience at Northgate Village. We agree that we are in a great location that is close to shopping, restaurants, major highways, and more. If there is ever anything we can do, please feel free to give us a call. Quiet, clean, and very family orientented submitted by Gabrielle C. - Feb 28, 2018 |Recommended: YesIts a great place to choose. Very quiet, no one bothers you. Parking right outside your own place, very clean. response from property - Mar 08, 2018 Thank you for your review! We are very happy you chose Northgate Village for your home! response from property - Feb 01, 2018 Thank you for your great review. 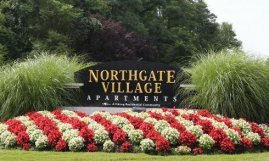 The staff at Northgate Village takes great pride in providing excellent service to all of our residents. We are happy you chose to make Northgate Village your home. This is a great choices for a first apartment because of price and its a nice place to live.submitted by Cinnamon D. - Dec 15, 2017 |Recommended: YesThe community is quiet and clean and has a mix of races and ages. My apartment is a nice size for the rent I pay. The only place I hear my neighbors is, on the steps leading up to my apartment, and the bathroom vent. The trash comes when its suppose to and the grounds are kept clean. I enjoy my stay and would recommend this place to anyone. response from property - Dec 15, 2017 Thank you for your review. I hope you enjoy your stay at Northgate Village. I like it here.submitted by Ankit P. - Oct 12, 2016 |Recommended: YesI really like the fact that heating and hot water is free for the residents which is very hard to find in other places. response from property - Nov 21, 2016 Thank you so much for the lovely review. We value your residency with us at Northgate Village and hope to have a long lasting relationship. Nice Place to Livesubmitted by Robin V. - Aug 03, 2016 |Recommended: YesThis is a nice quiet community to live in. The grounds are well kept and the staff is exceptional always polite and helpful. Good proximity to stores and major highways. response from property - Nov 21, 2016 Thank you for your review. We hope to have a lasting relationship with you as a resident of Northgate Village. Satisfied submitted by Ricardo G. - Jun 03, 2016 |Recommended: YesI wo9uld explain that I enjoy living at Nortgate because I feel very safe. Secondly, I would explain that the staff is very respectful and repairs are completed in a timely manner. Third, I would explain that the facilities are well maintained and presents a welcoming environment. response from property - Nov 21, 2016 Thank you for the good review. Please know that we appreciate our residents and hope to have a long lasting relationship. For the price a great place to rentssubmitted by Micah S. - Jun 02, 2016 |Recommended: YesQuit neighborhood and a great location to live. response from property - Nov 21, 2016 Thank you for taking the time to give us a review. We value your residency with us at Northgate Village. Perfect place for me submitted by Jamaine P. - May 31, 2016 |Recommended: YesI moved to this area recently and have fallen in love with Northgate Village. It is literally next to everything Shopping, entertainment, and two major highways that get me to NY, PA, and various parts of NJ in a reasonable amount of time. With all of the tenants in this complex I thought it would be loud. However, this is not the case. My neighbors are nice, quiet, and friendly. The onsite laundry facility is perfect for me. If I had one complaint it would be that some people leave their laundry in the machines for hours which keeps other tenants from doing their laundry. response from property - Nov 21, 2016 Thank you for the nice review and for choosing Northgate Village for your new home. We hope to have a long lasting relationship. Nice propertysubmitted by Talina C. - Apr 25, 2016 |Recommended: YesPlenty of parking, however, residents tend to take more than one spot...and visitor parking is not clearly marked to avoid taking the wrong spots. Maintenance has extremely quick responses. Office staff is very friendly and professional.